Cavenaugh QH LLC paid $115,000 forJess So Sixy, Friday's high-seller at the Heritage Place Winter Mixed Sale. OKLAHOMA CITY, OK—JANUARY 18, 2019—Quality mares, broodmares, racing prospects and short yearlings fueled a strong opening session to the 2019 Heritage Place Winter Mixed Sale on Friday in which 313 horses grossed $4,038,800 for a $12,904 and $8,500 median. Of the 351 offered, 38 went unsold for an RNA rate of 10%. During last year's opening session, Heritage Place reported 240 head sold for $2,059,200 for an average of $8,580 and median of $5,500. Due to this year's sale be reduced to a two days compared to three days in 2018, 111 more horses sold in the increased offering on day 1. "We sold 90% of the horses offered today and the first day average was up 21 % over last year’s 3-day average," Heritage Place General Manager Spence Kidney said Friday night. "We had a tremendous crowd on hand that seemed ready for business. We are looking forward to another great day to wrap up the 2019 Winter Mixed Sale tomorrow (Sat)." When stakes winner and multiple grade 1 finalist Jess So Sixy was led into the ring during Friday's special session, the John Andreini Partial Herd Dispersal, the mare did not disappoint, selling to Cavenaugh QH LLC for $115,000. The price paid for the 12-year-old daughter of leading sire Mr Jess Perry was the highest price on Friday's opening day. The $145,535 Anaheim Overnight Handicap winner, consigned by Lazy E Ranch, LLC Agent for John Andreini, was in foal to champion/champion sire Tempting Dash. A pair of short-yearlings by 2018 Leading Sire of Money Earners Apollitical Jess captured the second and third highest prices on Friday. Turner Farms paid $88,000 for Hip 255, Apollitical Effort, a colt by Apollitical Jess from the Strawfly Special mare Strawfly Sting. Roger Daly, Agent for Ken Phillips consigned the half-brother to stakes-placed Sizzling Gold and stakes-placed Aberdonian. Lazy E Ranch, LLC Agent or John Andreini consigned Hip 195, an unnamed Apollitical Jess half-brother grade 3 winner and champion sire Desirio. 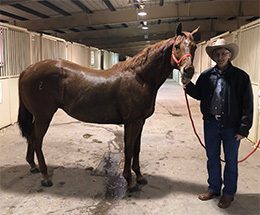 Valeriano Racing Stables LLC signed the $70,000 ticket for the colt out of grade 1 winning Sixarun mare Lady Tenaya. Cavenaugh QH LLC was the day 1 leading buyer with five purchases totaling $217,000. Pleasant Valley Ranch paid $148,500 for nine head and MJ Farms purchased three head for $143,00. Lazy E Ranch, LLC Agent for John Andreini was the leading consignor and/or agent on day 1 with 33 head grossing $736,000. Bobby D. Cox sold 28 head for $357,200 and Lazy E Ranch, LLC Agent had 16 head gross $281,500. Apollitical Jess led sires of short-yearlings (by average with two or more sold) with two head averaging $79,000 on day 1. FDD Dynasty had two for a $21,750 average and Pyc Paint Your Wagon sold four short-yearlings for a $19,125 average. Tempting Dash was the leading covering sire (by average with two or more in-foal mares sold) on day 1 with two for a $66,000 average. Champion Jess Good Candy had three in-foal mares average $31,333 and champion Ec Jet One saw two in-foal mares average $22,500. For Friday's preliminary results, and hip-by-hip results, CLICK HERE. Day 2 (Saturday) will begin at 9:00 a.m. (CST) with Hips 375 thru 748 in one mixed session. The Winter Mixed catalog is available for download at the Heritage Place website www.heritageplace.com or by CLICKING HERE. The Winter Mixed catalog is also available for download through RGP Catalog App. Search for RGP Catalog App on iTunes or Google Play. For additional information contact Heritage Place Sale Company at 405.682.4551. Preliminary sales results for both days can found in the Auction Leaders section on StallioneSearch.com following Saturday's closing session.